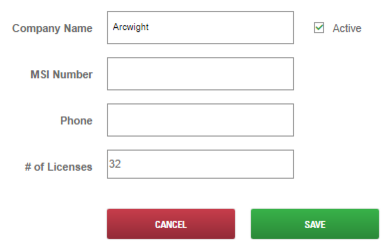 Editing a Customer allows you to modify the fields associated with that Customer except the Customer Alias. Additionally, you can add an MSI Number when editing a Customer. Customers may be modified by a Partner or Partner Employee. Customer Employees cannot modify their own Customer. In the Partner or Partner Administrator portal page, click Customer. list of all existing Customers assigned to your account appears. Under the STATUS field, click the Pen icon next to the Customer to edit. The Customer editing screen opens. In the Customer editing screen, modify data as necessary. Click the SAVE button when you are done editing. Changes are active immediately.